I believe of all the Wee ones I showed on facebook it was the Koala that was everyone's most favorite. I'm excited to share this pattern with you and I hope you enjoy. If you have any troubles there is a video tutorial to help you along! 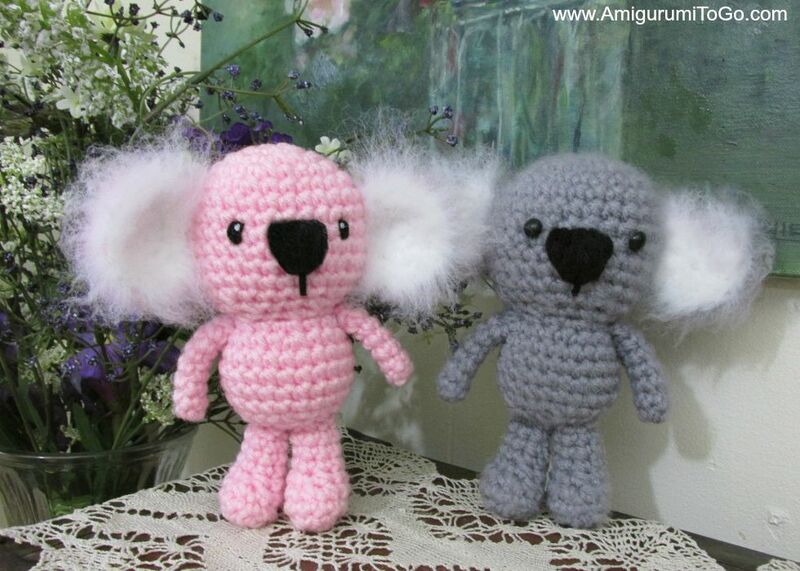 You can pick up the other animal pattern links in one post here and you can scroll down this page for the koala pattern. you can use felt, buttons, a french knot or paint eyes on. I used 7.5mm safety eyes that I glued in after the doll was done. EYES: If you use safety eyes then put those in between the 8th and 9th row with 5 visible stitch holes between them. 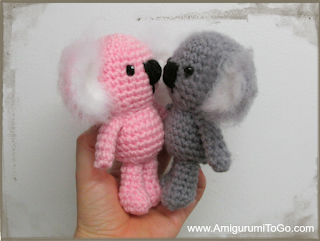 I used 7.5mm for the grey koala and black yarn for the pink koala. But of course you can use anything you want for eyes including felt, paint, or buttons.To make the ears and tail fuzzy I used a steel pet brush. You can also use a regular medium to hard bristle brush, toothbrush or even a piece of Velcro. BODY PATTERN: First you need to make the basic body which is right here. Then come back and follow the rest of the pattern below to make your wee koala. 4) sl st the next 4st and f/o leaving a tail for sewing on the outer ears. Weave in yarn tail on the inner ears. Place the wrong sides of one outer and one inner ear piece together. Sew them together. Brush the inner ear to make it as fuzzy as you want. 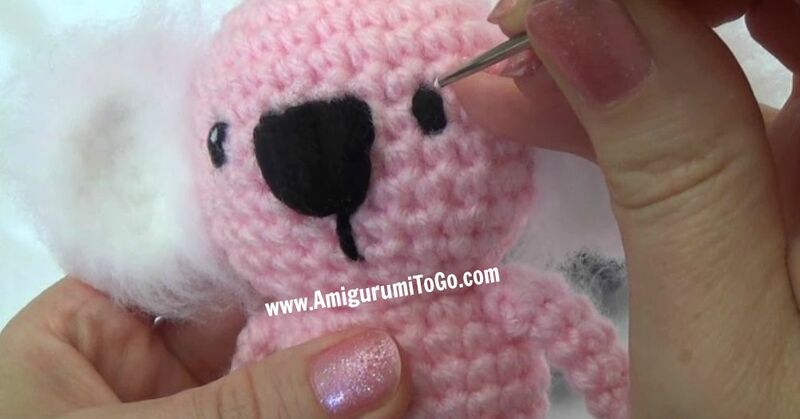 Brush along all the sides, including the side that gets sewn to the head. Sew to the head as pictured. When you sew the ear in place some of the fibers will get sewn in as well so be sure to brush more as needed. Tail: Yes, I know that real koalas have no tail. It feels a little bare without one so leave it off or add it as you wish. just add a few whip stitches in the back where you think a tail should go, knot off when done and hide the yarn tails inside the body. Use a brush and go over the tail to make it fuzzy. And you're done! Remember to post pictures of your Koala on my facebook page, Amigurumi Freely, I'd love to see! Thank you! I have been anxiously waiting for the wee furry friends, they are so lovely!!! These koala's are so cute. I love the pink one. Thanks for sharing this pattern. Koala + Sharon's brain = OMG CUTE OVERLOAD! You just know I'm gonna be making a pink one. My fave colour and those fuzzy ears! Just so much love. These are so cute! Can't wait to try them! but what if i want to make larger one, how to do it? Thanks for your clear videos! I really appreciate! I'm hoe trying out the Koala. I also would like to make a bigger Version. Is this possible? Hoe do I do this. Ik created your elephant, it's lovely! Can I make the Koala in this size? could you paint the eyes? Well, I am Australian and we know they aren't bears but we indiscriminately call them koalas or koala bear. In fact, how much can a koala bear? I believe that Teddy Roosevelt started the trend of calling them bears. But that could be a tall tale. Speaking of tall tales, we tell tourists that there is a type of carnivorous koala called a drop bear. Drop bears are twice the size of normal koalas and sit in trees and catch their prey by dropping on them from a great height.